In 2017 Sam Stone sat down for an interview with Katherine Cook of the Cameron K Gallagher Foundation, and we’re sharing that here. Stone’s Office Equipment has supported the CKG Foundation for years, and we will continue to! 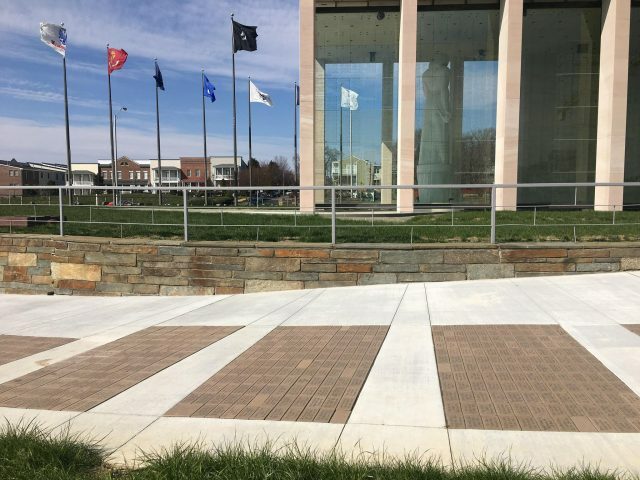 Stone’s Office Equipment are proud to support the Virginia War Memorial through their Walkway of Honor. Since 1956 the Virginia War Memorial has stood to honor all Virginians who have served as well as those who do so today. The Walkway of Honor is a wonderful way to honor a loved one, a friend, or simply to show your support for all our veterans and servicepeople though this great organization. The Virginia War Memorial is the Commonwealth of Virginia’s premier monument, museum, and educational center honoring the memory of all Virginians who demonstrated a willingness to serve and fight to defend the United States from World War II through today. Dedication Day was February 29, 1956. Honor a family member or friend who served in the armed forces. Recognize a military unit or veterans group. Or simply just show your or your organization’s support of the Virginia War Memorial and its educational and patriotic mission. By purchasing an engraved brick with a personalized message, you will leave a lasting legacy and contribute a permanent feature on the Memorial grounds. The Walkway of Honor overlooks circles around the Shrine of Memory and overlooks the James River. It serves as a solemn place where visitors can come for a moment of respite and reflection. Stone’s Office Equipment is proud to sponsor this great endeavor to help build and preserve the memory of all those who have served to defend our freedom and liberties. Stone’s Office Equipment is proud to be associated with the Ashland Theatre Restoration Project and the Official Office Equipment provider for their Center of the Universe office. Thanks to generous State, Town, corporate, foundation and individual support, Ashland Theatre is close to its capital campaign goal. Because of this generosity, Ashland Theatre will soon open its doors with expanded stage and lobby, new seating with cupholders, VIP box seats, state of the art surround sound and digital projection, gourmet concessions and more! Movies, music, comedy, live performances. If you would like more information about this topic, please contact Sam Stone at 804-288-9000 or email at sstone@stonesoffice.com. 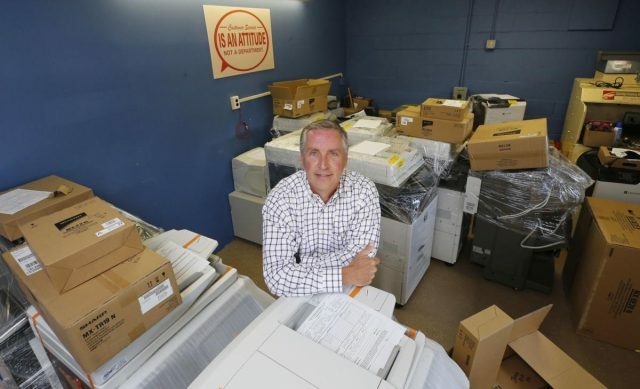 We were thrilled to read this piece on Stone’s Office Equipment in The Richmond Times-Dispatch on September 30th. The piece quotes Rich Reinecke of the Fahrenheit Group and Edward Barnes of the Barnes & Diehl law firm. We thank them both for their kind words! You can hear more from them on our testimonials page. The company began selling copiers in the early 1990s. It picked up the Sharp line in 2000 and has been a Sharp dealer ever since. 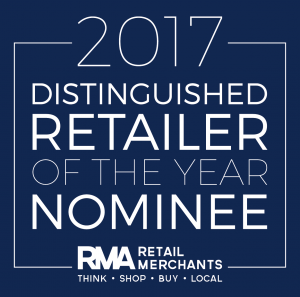 “For being a small, local business we are recognized annually by people in our industry as one of the top dealers in the nation,” Stone said. Customer satisfaction is the most important part of the Stone’s Office Equipment experience, but did you know that there’s actually a straightforward system for measuring exactly how happy customers are with a company? It’s called a Net Promoter Score – and you might be surprised to learn that some of the most well known companies aren’t necessarily the ones that make their customers the happiest. What Exactly is an NPS? 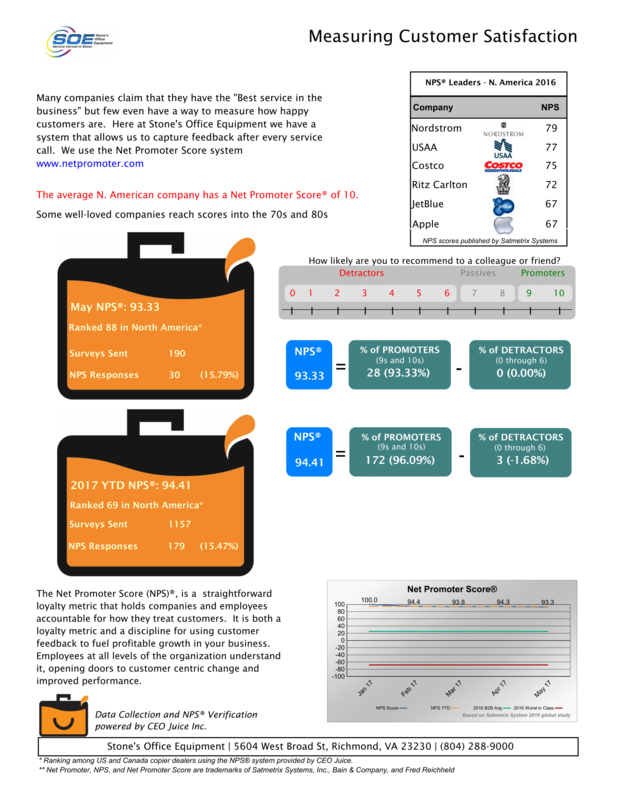 What is Stone’s NPS Score and Why? As we mentioned, customer service is our biggest priority at Stone’s Office Equipment and it’s because of that attention to our customer’s well being that as recently as May of 2017 we have achieved a Net Promoter Score of 93.3! This isn’t just a fluke, we survey our customers anytime we fill and order, ship a product, or make a service call to make sure that we’re getting regular feedback on their satisfaction and able to constantly improve the way that we do business. It’s our customers that make us who we are and we make a great effort to listen to what you love and especially your concerns so that we can solve your problems and continue to delight the people who choose Stone’s Office Equipment. If you have a need for better document management or office equipment and want to see what customer service with a 93.3 NPS score feels like then contact us and begin optimizing your office performance. 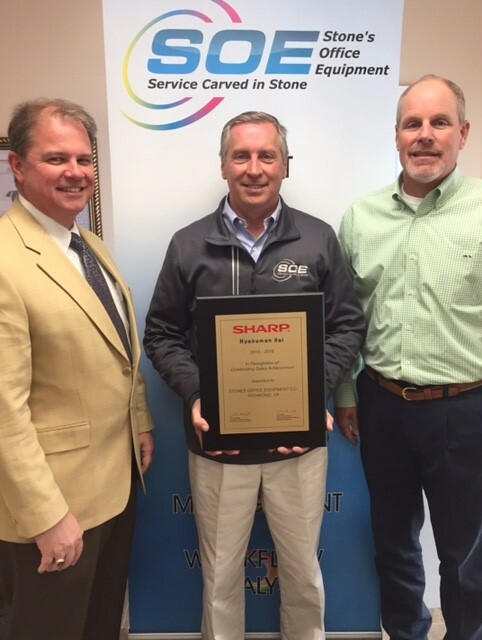 Once again, for the fifth consecutive year, Stone’s Office Equipment in Richmond, VA has earned The Sharp Hyakuman Kai award. 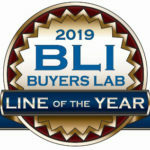 This award is given only to dealers that make outstanding achievements and who make major contributions to the success of Sharp Imaging and Information Company. Stone’s Office Equipment has been advocate of Sharp products for many years due to their quality, reliability, and efficiency. Sharp products simply make sense for a lot of different businesses – from high volume offices, to the smallest businesses. Sharp has a full-featured product line with price points and capacity to match any budget. We’ve written previously about what The Sharp Hyakuman Kai award means for you (our customers). We’re proud to represent Sharp office products in the central Virginia region. If you have questions about which Sharp office machines are best for your business, don’t hesitate to contact us.